The accommodation with approximate room sizes briefly comprises pillared storm porch with solid wood entrance door with glazed panels to top and attractive glazed side panels. Spacious entrance hall having solid oak flooring, radiator, doors to study and cloakroom, internal French doors giving access to the kitchen/breakfast room, stairs rising to first floor with large storage cupboard under, ceiling light fitting, coving, ample power points. A fabulous room comprising to one side; roll edged working surfaces with inset one and a half bowl acrylic sink with mixer tap and single drainer, range of beech effect drawers and cupboards under, integrated appliances include dishwasher, fridge and freezer, inset 4-ring Zanussi gas hob with extractor fan over and built in double oven. Central island unit divides the room between kitchen and family area, with cupboards and shelving, complement of matching wall mounted cupboards, UPVC double glazed window to the rear elevation overlooking the garden and door to utility room. To the other side of this area is the family and breakfast area, with ceiling light fittings, power points, UPVC double glazed French doors that open out to the rear deck and gardens, radiator, ceramic tiled flooring, part tiled walls, inset ceiling spotlights, door to the dining room. A useful room having matching roll edged working surfaces with space under for washing machine and tumble dryer, complement of wall mounted cupboards, inset stainless steel bowl with single drainer and mixer tap, part tiled walls, ample power points, ceiling track spotlights, extractor fan, UPVC door with obscure double glazed window to side elevation, fuse board, radiator. A good size dining room with lovely oak flooring, UPVC double glazed French doors with glazed side panels leading out to the rear patio, ceiling light fitting, power points, internal glazed French doors to the lounge. A very attractive room has UPVC double glazed window to the front elevation, feature gas fireplace with stone surround and hearth, ceiling light fittings, ample power points, two radiators. White suite comprising low level WC, pedestal wash hand basin with tiled splash back, UPVC obscure double glazed window to the side elevation, solid oak flooring, ceiling light fittings, radiator. A useful home office having UPVC double glazed window to the front elevation, solid oak flooring, built in desk and workstation with drawers and cupboards, wall mounted cupboards to include glazed display cabinets, ceiling spotlight cluster, radiator, power points. A spacious landing area having stairs that continue up to the second floor and doors to the three main double bedrooms, radiator, UPVC double glazed window to the front elevation, ceiling light fitting, power points. A charming room having UPVC double glazed window to the front elevation, ceiling light fitting, radiator, power points and opens through to the dressing room area. Having large built in wardrobes, radiator, ceiling spotlights, obscure double glazed window to the side elevation, further door to en suite bathroom. White suite comprising low level WC, vanity mounted wash hand basin with mixer tap and cupboard under, panel enclosed bath with shower attachment and mixer tap, double width walk in shower with Triton power shower, fully tiled with folding glazed doors, part tiled walls, obscure double glazed window to the rear elevation, shaver point, ceramic tiled flooring, radiator, ceiling light fitting, extractor fan. A delightful bedroom at the rear elevation having UPVC double glazed window overlooking the garden, ceiling light fitting, bank of built in wardrobes to one wall, radiator, power points, door through to en suite shower room. White suite comprising low level WC, pedestal wash hand basin, fully tiled double width shower cubicle with Triton power shower and glazed folding door, obscure double glazed window to the rear elevation, ceiling light fitting, extractor fan, part tiled walls, radiator, shaver point. A bright and airy bedroom having double glazed window to the front elevation, radiator, ceiling light fitting, ample power points, two built in wardrobes, door through to the en suite shower room. White suite comprising low level WC, pedestal wash hand basin, fully tiled double width shower cubicle with Triton power shower and glazed folding door, part tiled walls, radiator, ceiling light fitting, obscure glazed window to the side elevation, extractor fan, shaver point. A lovely double bedroom with UPVC double glazed Dormer window to the front elevation and Velux roof light to the rear, eaves storage space, radiators, ceiling light fittings, power points. A further bright and spacious double bedroom having UPVC double glazed window to the front elevation and Velux roof light to the rear, ceiling light fittings, radiators, power points, access to the loft storage space. White suite comprising low level WC, pedestal wash hand basin, panel enclosed bath with mixer tap and shower attachment, ceiling light fitting, radiator, obscure glazed window to the rear elevation, extractor fan, shaver point. The property is approached via a private driveway that gives access to the double garage, having up and over doors and side courtesy door. To one side is an attractive shrub border and raised pathway leading to the front entrance door with lawn to either side. The rear garden is fully enclosed with timber panel fencing and has a large decked area to the immediate rear that is access from the kitchen and dining room. The garden has been mainly laid to lawn with flower and shrub borders to the rear, further raised decked seating area, garden shed. 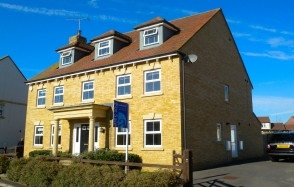 The property is connected to mains drainage, electricity, gas and BT telephones and benefits from oil fired central heating. DIRECTIONS; From our Felsted office applicants are advised to turn right and proceed along Station Road and on approaching Little Dunmow take the first turning left into the Flitch Green development. Continue over the first roundabout and take the left turning into Tyler Avenue. Follow this road round and No 16 can be located on the right hand side as indicated by the Andersons for sale notice.